Nirafon acoustic cleaning system removes particles from the surfaces by an acoustic pressure shock. The pressure shock is repeated until the required results for the cleaning have been achieved. 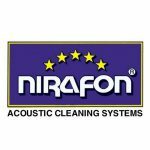 Nirafon acoustic cleaning system is a combination of sonic horns, selected for each application separately, and automatic control equipment that optimizes the cleaning results. The desired level of cleanness is constantly maintained and the process can continue without any interruptions. Keeps the super heaters, economisers, air preheaters, flues, filters and fans of the boiler plants clean and prevents vaulting of particles in the silos and cyclones.